Self-skinned urethane seat & back (black only). Pneumatic lift adjusts seat from 22" to 32". Height adjustable footring. Chrome footrest is independently height adjustable. 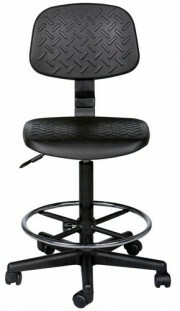 5-star nylon resin reinforced base with dual wheel casters. TAA compliant. 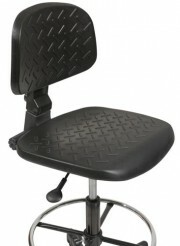 Swiveling seat measures 17"w x 16.5" d 300 lb weight capacity.